In "Canoa," villagers embark on a bus ride from which they will never return (Courtesy of Janus Films). 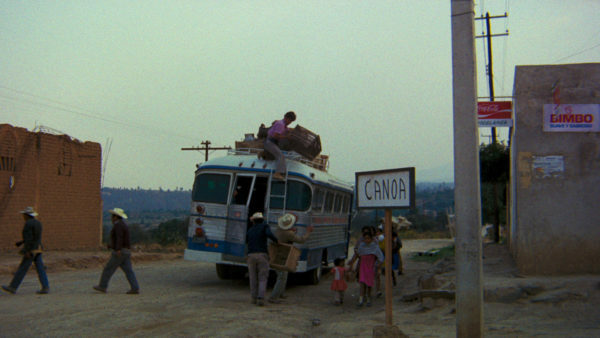 In “Canoa,” villagers embark on a bus ride from which they will never return (Courtesy of Janus Films). Welcome to “Throwback Thursdays,” a new film feature at The Stanford Daily. Every Thursday (hopefully), the Arts & Life section will publish reviews highlighting older or more obscure works — sometimes both — that are currently not playing in traditional theaters. This week, critic Amir Abou-Jaoude recommends Felipe Cazals’ “Canoa: A Shameful Memory” (1976) for its combination of cinéma vérité style and political paranoia. “Canoa: A Shameful Memory” can be found in the Media & Microtext Center under the call number ZDVD 40608. Felipe Cazals’ “Canoa: A Shameful Memory” begins with a title card telling us what follows is a true story. So many movies begin with this claim that the late film critic Roger Ebert once joked that he had “grown immune to it.” In the case of “Canoa,” however, Cazals uses this device not to dubiously link his film to reality, but to introduce a rather bizarre story. On a holiday weekend in September 1968, five employees of the Autonomous University of Puebla decided to hike La Malinche, the sixth-highest mountain in Mexico. En route, however, they were caught in a strong storm and were stranded in the village of San Miguel Canoa at the foot of the mountain. The villagers were anything but hospitable. Convinced that the employees were communists, they lynched four of the five. Cazals’ film uses this gruesome incident as a starting point to create a perceptive study of how paranoia and poverty incite man’s inhumanity towards man. Cazals’ examination of these issues begins as he establishes the environment in which the murders took place. He employs documentary techniques to convey these essential facts. A narrator tells us that San Miguel Canoa is only accessible by a pothole-ridden dirt road. Although there are three schools in the area, most of the population is illiterate because they cannot afford education. The soil is barren, and many residents resort to illegal wood trafficking to make a living. There is only one church in the town, and while we are told that the priest’s “influence is decisive in the life of the town,” this priest does not seem to take the Christian principles of charity and benevolence to heart. Instead, he relentlessly taxes the villagers, appoints corrupt officials to government positions, uses his influence to silence anyone who disagrees with him, and delivers polemics on the cruelty of communists. Cazals also conveys information about the town by interviewing the various villagers. Looking directly into the camera, they tell us about life in San Miguel Canoa. The villagers are primarily concerned with the fertility of the soil and the state of the wood trade. Most believe that the priest’s program is benefitting the village. While they complain about his taxes and his excesses, they commend him for bringing electricity to the town and building a new school. Only one villager, the communist Lucas, warns of the priest’s autocratic tendencies. These interviews illustrate that the priest wields enormous power because the villagers are desperate. They also remind viewers that although San Miguel Canoa is a real town, it will later become the stuff of legend. Still, even as the town descends into barbarism, Cazals maintains his objective focus, which renders this story as history, not as tragedy. He includes title cards counting down the minutes until the hikers’ deaths, creating a sense that the hikers are being overcome by the inevitable. Indeed, after the hikers arrive, San Miguel Canoa becomes an inescapable hell. It recalls the historical Jonestown, with the priest as an anti-communist version of Jim Jones, or the legendary Western town of Tombstone. The hikers, however, are not the Earp brothers. They are unremarkable individuals, searching for some recreation, not adventure. They are looking to get drunk and find some beautiful girls. These ordinary people have no way to reestablish law in Canoa, so they are swallowed up by the lawless mob. Yet, through the hikers, Cazals makes a comment on Mexico’s politics. 1968, the year in which “Canoa” is set, was a defining year in Mexican history. The Olympics were held in Mexico City, and students gathered there to protest the corruption of the PRI, the ruling party. They were mercilessly gunned down by the police. Before going to Canoa, the hikers listen to news reports of the massacre, but they remain outside of the fray. When student demonstrations against the government occur at the university, the hikers do not take a stand. In Canoa, however, these apathetic individuals are branded as rabblerousing communists. As events in Canoa unfold, Cazals suggests the political climate is so volatile that even the most apolitical people find themselves at the center of current events. Therefore, “Canoa” becomes not just a study of a horrific incident, but a survey of Mexico’s political landscape after 1968. Perhaps because of its outlook on Mexican society in this era, “Canoa” is cited as one of the greatest Mexican films. Directors like Guillermo del Toro and Alfonso Cuarón have championed it. Yet, while the story of “Canoa” certainly concerns Mexican society, the film seems universal. Cazals’ story recalls other shameful events, such as the Salem Witch Trials and the 1950s Red Scare in America and the Dreyfus Affair in France. Furthermore, his study of the dangers of demagoguery and the perils of paranoia seems eerily relevant today. As new demagogues rise to prominence and poverty increases, we leave the film reminded that history can repeat itself.